Alright, I held off as long as I could. I needed a little bit of detoxing after the holiday baking fest, and I have eaten more than my fair share of salads and vegetables as of late, and honestly if feels great to get into some better eating habits over the past couple of weeks…but sure enough my cravings for baked goods and chocolate came roaring back (as I knew they would). Which is fine. I completely believe that a healthy treat every once in a while is key to successful long-term weight loss, healthy lifestyle, and healthy relationship with food…so I got to work and came up with these beauties. I was inspired to come up with a nut-free Paleo brownie by my darling sister-in-law. She came to visit over Christmas, and I made all sorts of my delicious baked goods for all of our company to enjoy; unfortunately, she is allergic to nuts. Pretty much everything I made had nuts in it. That is when I realized I needed to come up with a delicious nut-free treat – challenge accepted! Wow! I am so glad I did because these brownies are so dang yummy. 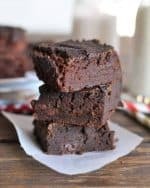 They are not super fudgy, but they are still really good with a slightly fluffy texture (don’t worry, this is not chocolate cake – I believe there is a firm distinction between brownies and chocolate cake and these still qualify as brownies). These also contain a secret hidden ingredient that makes them extra healthy and strangely delicious – Avocado! I have never baked with avocado, but I think I will try it more often. It adds some moistness and density to the brownies, and I promise, you won’t even taste the avocado. Trust me, I am not going to waste my time with brownies that taste like avocado, even though I LOVE avocado :). These Paleo brownies are also gluten-free, grain-free, dairy-free and Clean Eating. As always – my kind of brownie! I also think you’ll love the maple syrup as the sweetener. It has a deep, rich flavor and since it’s a natural sugar, my body can handle it so much better than almost any other sweetener. I would love to know if you try these and what you think of them. Please comment below and let me know what you think! 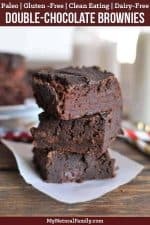 These double chocolate Paleo brownies are a healthy, low calorie, and delicious treat that include a secret ingredient. You won’t be able to stop eating them! These are the 9 best Paleo brownies that will help you satisfy your chocolate cravings. Although not all of these recipes are chocolate. You deserve a sweet treat once in awhile. There seem to be 2 different kinds of the Paleo brownies recipes. One kind of paleo brownies recipes are made with an alternate kind of flour such as coconut flour or almond flour. The other kind is made with no flour at all and the main ingredient might be zucchini or plantains or banana or almond butter. Some of these kinds of paleo brownies recipes may or may not be baked but may be raw. In my opinion, the latter just aren’t brownies so I tried to avoid that kind as much as I could. Some of these have bananas or pumpkin in them but it isn’t the main ingredient. Those recipes also have some kind of flour and the pumpkin and bananas only add moisture and flavor. I love brownies for two reasons: they taste good and they are easier to make than cookies. Simply because you only have to bake one pan of them. I like mine nice and chewy and I like to make them because I can mix them with my mixer easily and dump them in a pan and bake them and be done with it. None of that getting a spoonful of dough just the right size and then doing that over and over again and then baking them over and over again. Only one pan to bake and you’re done. It’s time to make your choice from the best Paleo brownies below and start baking it up. These brownies are easy to make and taste really good. I know they aren’t chocolate but sometimes you just don’t want chocolate. Maybe you can’t or shouldn’t eat chocolate either. These are just a basic brownie recipe without the chocolate but I think they are still delicious. They remind me of brownies my mother used to make when we wanted a treat but didn’t have much money to spend on ingredients. These are rich and fudgy but not overly sweet. You can taste the maple flavor a little and it pairs wonderfully with the pecans and the crunch they add is nice. Just a couple tips: If you store them in a plastic container they will get moist. Put them on a plate and cover them with some tin foil. Bake them in a disposable foil pan that you can buy at the $ store. Instead of having to dig them out of a pan and some of them being messed up when you serve them. You can cut the sides of the foil pan and tear the sides down and get them out easily. Just throw the cut up pan away. Did you know there are two kind of people? The cakey brownie people and the dense brownie people. These are dense brownies just to warn you cakey brownie people. These are a very dense chocolatey, fudgy, melt in your mouth kind of brownie. Skip the sprinkles “Jimmies” they aren’t Paleo. All they are is sugar. Putting pumpkin in these brownies adds moisture, vitamin A and fiber. There is no pumpkin spice so you really can’t taste the pumpkin at all, especially with the cocoa powder in it. If you want it to taste pumpkin-y you could add a little pumpkin spice. They really taste kind of fudgy but they aren’t that heavy. What do you think of when you hear hazelnuts and chocolate. You guessed it! Nutella. Well, these have hazelnuts and chocolate but these are a much healthier option. These have just enough hazelnut crunch mixed in with all that fudgy chocolate goodness. They are topped with an easy and quick ganache. Yes, by easy I mean you stir chocolate and coconut oil together. If you want a healthy brownie, these are about as healthy as you can get. Even though they are healthy they are still perfectly dense, sweet and delicious and of course fudgy. The avocado ganache really makes them more spectacular. To answer that question on your mind, NO you can’t even taste the avocado. Avocados just make the ganache nice and creamy. Imagine chocolatey rich brownies with a hint of gingerbread. They are filled with rich chocolate and topped with mini chocolate Chips. Avocados are added to make them creamy and moist. The combination of chocolate and gingerbread seems like a match made in heaven. All of these really are some of the best Paleo brownies you can find. Who doesn’t love brownies? Paleo brownies are just what I need! I have not tried it without the maple syrup. I think it definitely needs a little bit of sweetener, you could try reducing it if you wanted to. Wow! These look wonderful and absolutely fudgy! Nice work! I am super impressed. I love the coconut flour you use too! Wonder if I could test these out without eggs? If you try them without eggs, let me know how they turn out, I haven’t tried it myself. These look so decadent, but healthy too! They are; it’s almost too good to be true :)!